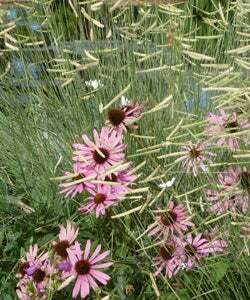 Echinacea tennesensis with Bouteloua Blonde Ambition. 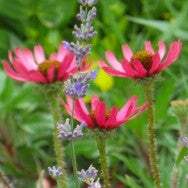 The genus Echinacea contains some of our most valuable and showy native wildflowers. There has been a tremendous amount of selection and breeding work done with the various species in the last decade resulting in an explosion of new cultivars (varieties). Some are superb, but most others are highly over-rated, especially some of the orange flowered hybrids (Big Sky series). Echinacea ‘Rocky Top Hybrid' is one that belongs in the "superb" category. Echinacea tennessensis, a species officially listed as an endangered species by the US Fish and Wildlife Service, is one of the parent plants that the breeders at Jelitto (the reknowned German seed company) used to create 'Rocky Top Hybrid' Purple Coneflower. I'm not sure what species was crossed with the wildflower to create this hybrid strain, but the plant looks very much like its E. tennessensis parent. This parent plant is found growing only in Cedar glades on limestone bedrock in its home state of Tennessee, but it has proven itself to be a superb performer in Western and Intermountain xeriscapes in well drained , non-clay soils. It also thrives in more eastern locations, all the way to the East Coast as long as it is grown in very well drained, alkaline (sweet) soils. While xeric 'Rocky Top Hybrid' appreciates extra moisture provided by some easily accomplished water harvesting techniques, plant it in a wide, shallow depression and mulch amply, or place right up against the north side of a low, wide rock tilted to shed water on the Echinacea's side. Blooming from mid-summer into fall, 'Rocky Top Hybrid' has wonderfully cheerful flowers much different from the typical horizontal or reflexed petals (that sweep backwards from the center cone). Its petals lean forward past the center cone resembling an old fashioned country girl's sunbonnet. The plant's strap-like leaves are very narrow and covered with soft, fuzzy bristles (a water conserving adaptation to reduce transpiration from the leaves). This is a wonderfully useful perennial that mixes easily with any number of summer-blooming, sun-loving perennials. I especially love to use it in combination with French hybrid Lavender (Lavandula intermedia cultivars), ornamental grasses, such as Little Bluestem (Schizachyrium scoparium), and blue flowered 'Blue Fortune' Hummingbird Mint (Agastache hybrid) for summer color that attracts and feeds our invaluable honey bees, other native bee species, and butterflies. I highly recommend it to all our customers as a truly unique and proven Coneflower variety.